If you’ve ever thought that the medium-duty market is a case of “the more things change, the more they stay the same,” it might be time to take a second look. While there’s electricity in the air across the trucking landscape, even some truck makers that have already shown off their prowess advancing battery-electric powered trucks for medium-duty use are also responding strongly to heightened back-to-the-future demand for gasoline-fueled trucks. Other hot trends in the bread-and-butter world of workaday delivery and vocational trucks include sustained efforts to bring even more highly advanced safety technologies to bear, as well as boosting vehicle connectivity to reduce operating costs, and finding ways to make trucks just plain more comfortable to drive. For instance, Mitsubishi Fuso, which laid claim last year to rolling out the first global all-electric truck in full production, has this year introduced specifically to North America the only gasoline-powered truck that it makes. Other brands offering gas power in this space include Isuzu, Mercedes-Benz, Nissan, and Ram. In the electric realm, Daimler has begun testing an electric version of the Freightliner M2 106 truck. And Isuzu, according to Brian Tabel, executive director of marketing, planned as of October to continue piloting five different trucks with five different customers to test its battery-electric truck in conjunction with electric drivetrain maker Nordresa. Among those ownership challenges? Downtime. The big truck news out of General Motors is the return of Chevrolet to the medium-duty market with an all-new lineup of Class 4 to Class 6 chassis- cab models for the 2019 model year, consisting of the Silverado 4500HD, Silverado 5500HD, and Silverado 6500HD. 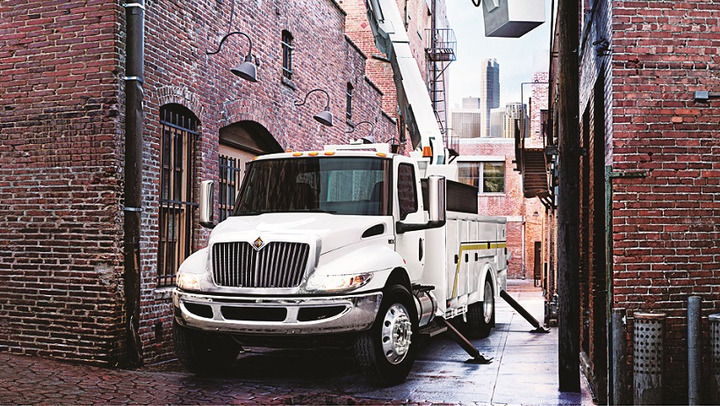 The three models were developed via a partnership with Navistar. Together, the models cover GVWRs running from 15,000 pounds to 22,900 pounds and offer seven wheelbase options as well as regular and crew cab variants. The Silverado HD models will be available in two- and four-wheel drive and will be powered by a Duramax 6.6L turbodiesel, rated 350 hp at 700 lb.-ft. of torque, mated to Allison automatic transmissions. A power take-off is optional. 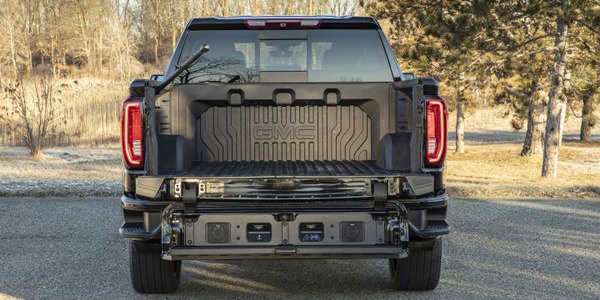 GM says the frame is designed with one-piece straight rails with no rivets or brackets on top to interfere with the mounting of custom-made bodies. In addition, more frame lengths are offered to help customers specify the exact truck to suit their needs. 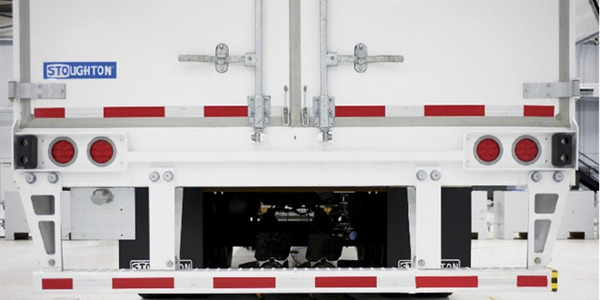 Serviceability features include a “clamshell” tilting hood and a wheel cut of up to 50 degrees that can give technicians better engine access than trucks with conventional hoods. Optional equipment includes twin-tank fuel capacity of up to 65 gallons, a factory-installed air suspension, and a suite of available connectivity offerings including OnStar, Commercial Link, and a built-in 4G LTE Wi-Fi hot spot. The Silverado HD boasts a design cue from the Chevy Camaro: The “flowtie,” first introduced on the front grille of the 2014 Camaro Z/28, is the chrome outline of the traditional Chevrolet bowtie with the center removed to increase engine airflow to help improve performance. 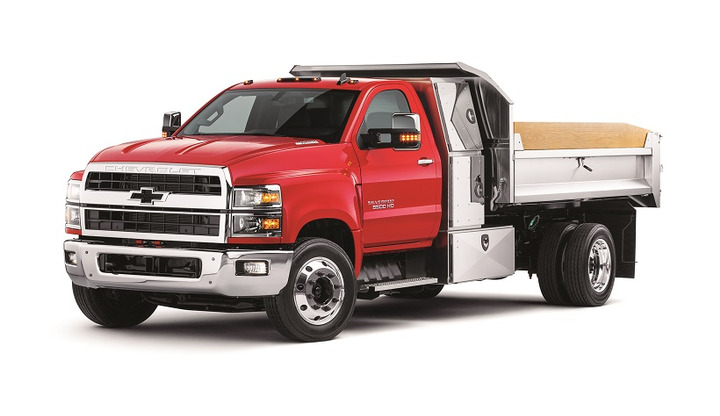 In addition to the three new conventional-cab Chevys, GM also continues to offer the Class 3 Chevrolet Silverado 3500HD and GMC Sierra 3500HD chassis cab as well as its line of Chevrolet medium-duty low cab forward trucks. 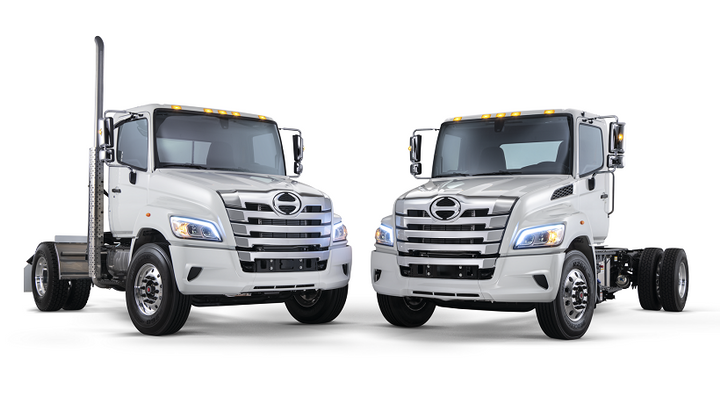 The Detroit DD5 and Detroit DD8 midrange diesels are available for spec’ing on Freightliner M2 106 medium-duty trucks. The DD8 is engineered to be a low-maintenance, higher torque and higher horsepower option for fleets operating in construction, dump, mixer, plow, and other tough-duty applications. The DD5 is designed for typical urban applications, such as last mile and P&D. 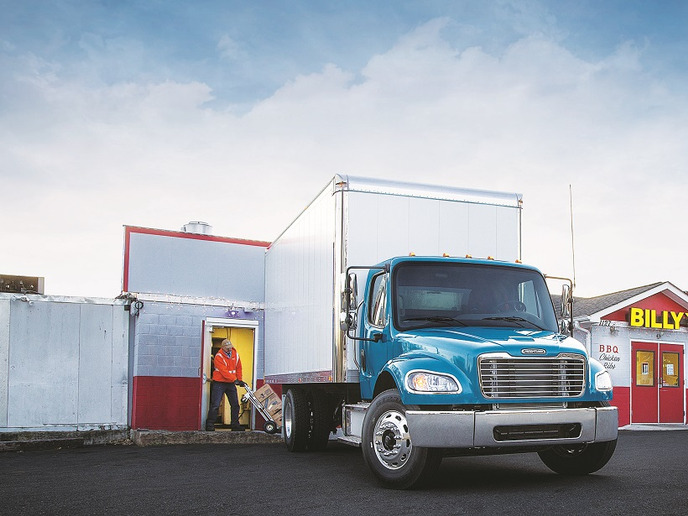 “These engines boast industry-leading maintenance intervals and come standard with Detroit Connect Virtual Technician remote diagnostic service,” says Kelly Gedert, director of product marketing, Freightliner Trucks and Detroit Components. “The engines also help medium-duty customers achieve maximum uptime with proprietary variable cam phasing, which enables more efficient aftertreatment system performance. At low engine speeds, the exhaust timing can adjust and open the exhaust valves earlier in the operating cycle. This causes warmer exhaust to be pushed in the direction of the aftertreatment system. And this allows for effective DPF regenerations, increasing uptime with reliable operation of the aftertreatment system.” The DD8, launched at this year’s Work Truck Show, expands on the Detroit medium-duty platform that was rolled out last year with the DD5. Daimler says the DD8 will feature both engine and transmission power take-off options. The newer engines will initially be available in the Freightliner M2 106, 108SD and 114SD models. Trucks powered by the DD8 will also feature Detroit Connect Virtual Technician remote diagnostic service. Daimler says Virtual Technician helps fleets make informed maintenance decisions, so vehicles are only serviced when needed. 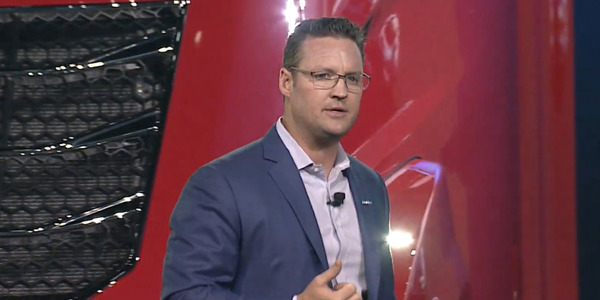 Should a vehicle need to go into the shop, Virtual Technician, backed by experts at the Detroit Customer Support Center, will provide access to in-depth information to help improve uptime. While Ford is expected to soon roll out a new edition of its Transit full-size van, the company says the current model boasts a range of enhancements that includes an increase in the standard rear door hinge opening angle on the 148-inch wheelbase model, from 237 degrees to 253 degrees. Also new are available running boards on chassis cab/cutaway versions. The rear recovery eye feature is now standard on both cargo and passenger vans, and a new high-strength laminated side glass is available for some configurations. Fleet customers can option white steel wheels with exposed lug nuts for dual-rear-wheel vans. Options on the Transit Connect compact van now include the first diesel engine available, while a new 1.5L EcoBlue turbocharged direct injection diesel is due out in 2019. Engines feature standard Auto Start-Stop and are paired with a new 8-speed SelectShift automatic transmission. Fleet customers can opt for a 2.5L iVCT I-4 gas engine with CNG/LPG gaseous fuel prep package. 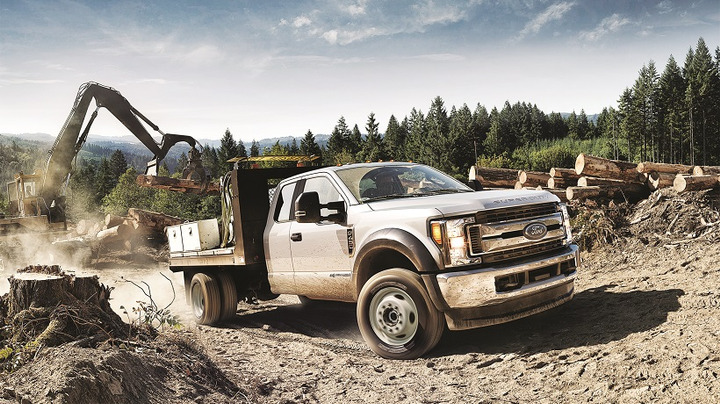 For 2019, the F-Series Super Duty carries over its high-strength steel frame and aluminum-alloy body, choice of 6.2L gas or 6.7L Power Stroke diesel, and TorqShift 6-speed transmission. Newly offered is optional FordPassConnect embedded 4G LTE modem, said to add greater connectivity. Ford, which offers medium-duty trucks that span Class 7, notes that its near-term future commercial vehicle plans include rolling out a new Transit with 4G LTE connectivity, extending production of its E-Series cutaway and stripped chassis into the 2020s, and offering automatic emergency braking, lane departure warning, Driver Alert System and other advanced technologies on future E-Series, F-650, F-750, and F59 chassis vehicles. Hino this year rolled out its new XL Series of Class 7 to 8 trucks, marking its next step in expanding its presence in North America. Both the XL7 and XL8 models are powered by Hino’s A09 8.9L inline 6-cylinder diesel engine and will be offered in both straight truck and tractor configurations. The different models will range from a GVWR of 33,000 to 60,000 pounds and a GCWR of up to 66,000 pounds. Maximum engine performance will top out at 360 hp and 1,150 lbs.-ft. of torque. Available wheelbases will range up to 304 inches. 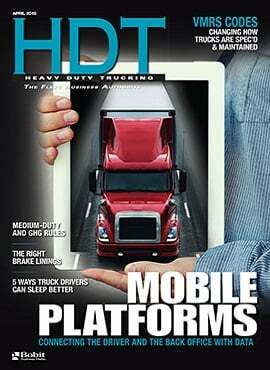 Tandem axle and fifth wheel configurations are being offered for a variety of vocational applications. The XL Series lineup features new active safety solutions with electronic stability control (standard on tractor models) and collision mitigation systems, payload management suspension options, and a body builder-friendly design to improve serviceability. Hino also paid attention to styling, ergonomics, and driver amenities. The cab features wide entry for easier access to what the company called an “automotive-grade finished interior.” The XL Series also provides an air-ride cab and driver’s seat, hands-free Bluetooth audio/calling, steering wheel controls, LED headlights, cruise control, and air conditioning as standard equipment on all 2020 model year XL7 and XL8 trucks. The benefits current Hino customers receive, including HinoWatch 24/7 roadside assistance, HinoCare maintenance programs, and its fully integrated connected vehicle solution, Hino Insight, will also benefit XL Series customers. The truck maker notes that Hino Insight Telematics carries a one-year complimentary subscription; Insight Remote Diagnostics and Insight Case Management are complimentary for five years. Production of the XL Series will start in early 2019; ordering opens in the fourth quarter of 2018. 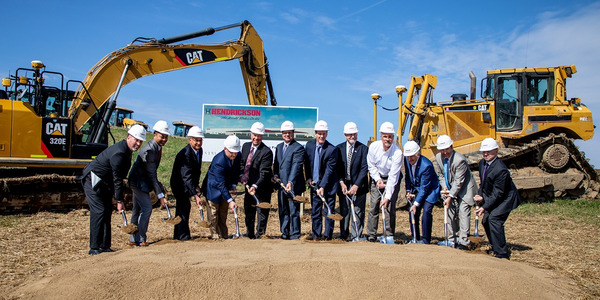 The trucks will be assembled in Mineral Wells, West Virginia, at a fully renovated production facility that Hino acquired in 2017. Navistar will unveil its new Class 4 and 5 International truck, developed in partnership with GM, this month. Earlier this year it revealed its new MV Series Class 6 to 7 trucks. The MV Series is the final piece of International’s Project Horizon product refresh strategy, and aimed to improve medium-duty cab design by including the same “driver-centric features” found in the company’s Class 8 vehicles. The MV was designed to be easily configured for varying applications. Key features include new cab doors with a lower bottom glass edge and removed vent window, giving the driver a single large piece of glass to improve side visibility and reduce blind spots. The position of the optional pedestal mirrors was optimized so drivers turn their heads less and keep their eyes on the road while reducing neck strain. A new gauge cluster with a digital driver display gives drivers real-time monitoring of vehicle operation and other important alerts in clear sight. The flat-panel dash contains space for up to 30 customizable switches to operate any type of body that is mounted; the switches boast large text and are backlit for easy viewing at night. A column-mounted stalk shifter was chosen to help keep drivers’ hands on the wheel and eyes on the road. The MV Series is also equipped with an improved HVAC system, which includes a high-performance “Max” defrost feature. An additional vent has been added to help keep the middle front passenger comfortable. 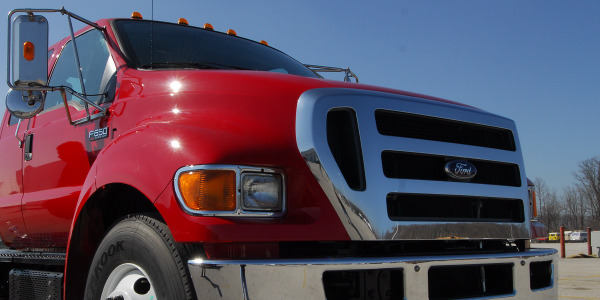 MV trucks can be ordered with regular, extended, and crew cabs. The vehicle can be powered by either a Cummins B6.7 or L9 engine. Standard transmission is the Allison 1000 HS automatic. Optionally available are Allison FuelSense 2.0, with DynActive Shifting, which features a torque converter to provide variable shift points based on vehicle operating conditions. 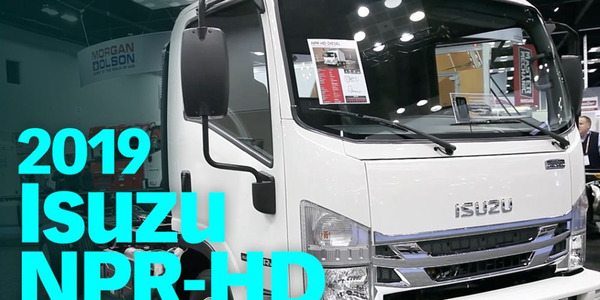 Following the launch of its all-new Class 6 FTR low cab forward truck last year, earlier this year Isuzu further grew its medium-duty lineup by adding a crew cab version of its Class 5 NRR cabover. Able to seat up to a seven-person crew, the NRR variant also carries a 19,500-lb GVW rating. Upfit applications will accommodate vocational bodies up to 30 feet in length with the standard cab and 16 feet with crew cab models. Production of Isuzu’s gasoline-powered NPR models began in January. Like the NRR, the NPR can be spec’ed with a seven-passenger crew cab option. Class 3 and 4 NPR trucks are available with gasoline power and can be ordered with CNG/LPG fuel capability. The gasoline engine in the NPR is the Vortec 6L V-8, which generates 297 hp at 4,300 rpm and 372 lb.-ft. of torque at 4,000 rpm. It’s mated to the GM 6L90 Hydra-Matic 6-speed automatic with double overdrive. 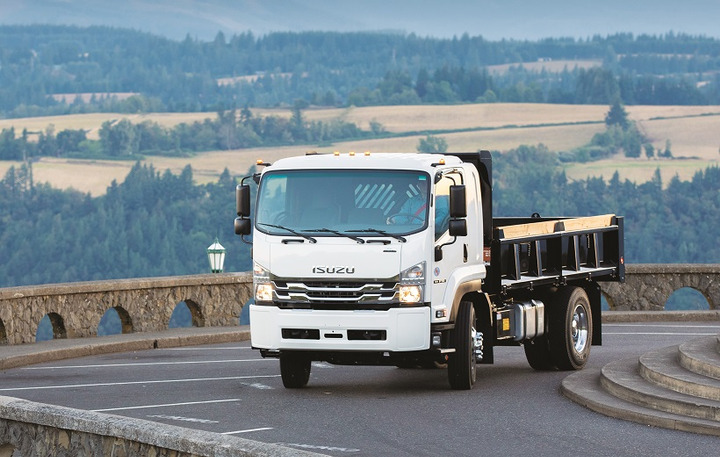 In August, Isuzu announced that the 50,000th gasoline-powered Isuzu N-Series truck was produced in Charlotte, Michigan. The Isuzu model was the first gasoline-powered low cab forward truck available in North America. Assembly began at Spartan Motors in April 2011. 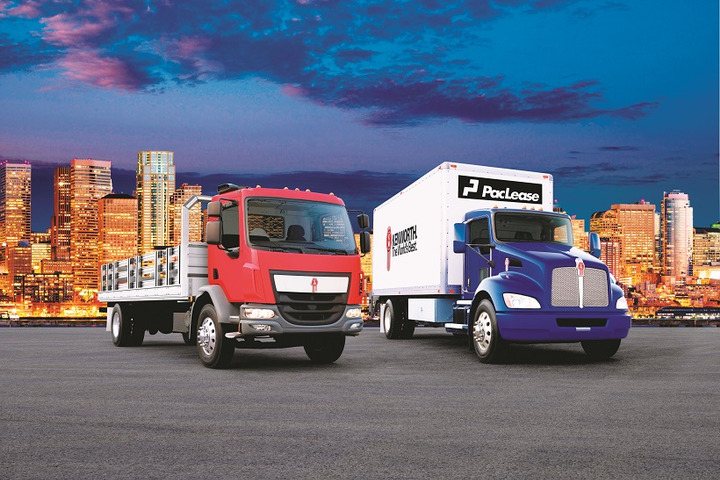 Kenworth’s medium-duty lineup consists of medium-duty conventional and cabover models. The Class 6 T270 and Class 7 T370 conventional trucks and tractors feature a 109-inch BBC, sloped hood, single rear or tandem drive axle, and optional cab corner windows. GVW ratings reach up to 66,000 pounds. Power is provided by Paccar PX-7 and PX-9 diesel engines, rated 200 to 350 hp and up to 1,150 lbs.-ft. of torque, and they can be mated to manual, automated, or automatic transmissions. 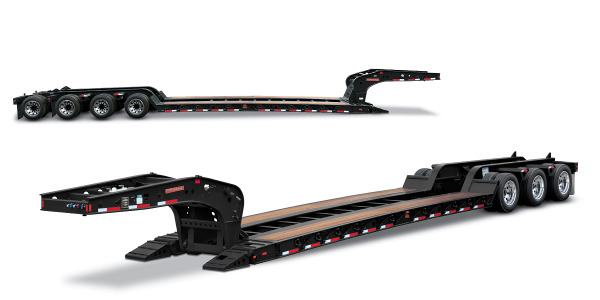 On the heavier T370, front axles are available rated up to 20,000 pounds. Now standard on the T270 and T370 are Dana Spicer S140 single-reduction, single-drive axles. The T270 has the S17-140 axle rated at 16,000 pounds, while the T370 is fitted with the S21-140 rated at 21,000 pounds. Kenworth notes that these axles provide “excellent reliability and durability with higher horsepower and torque engines due to high-capacity gearing.” Optionally available is the in-dash Kenworth NavPlus HD system, as well as 4x4 and 6x6 drive configurations. The Class 6 K270 and Class 7 K370 4x2 cabovers feature a 63.4-inch BBC, 55-degree wheel cut, an automatic transmission, a single rear drive axle, and Paccar PX-7 diesel engines, rated from 200 to 260 hp and 520 to 660 lbs.-ft. of torque. They come standard with front and rear drum brakes and with 22.5-inch tires and wheels (19.5-inch package available). Front air disc brakes and rear air suspension are optional. Standard onboard are an air suspension driver’s seat and two-person bench seat. Now available on the K270 and K370 are the Dana Spicer S140 series of single-reduction, single-drive axles, ranging from 16,000 to 21,000 pounds gross axle weight rating. 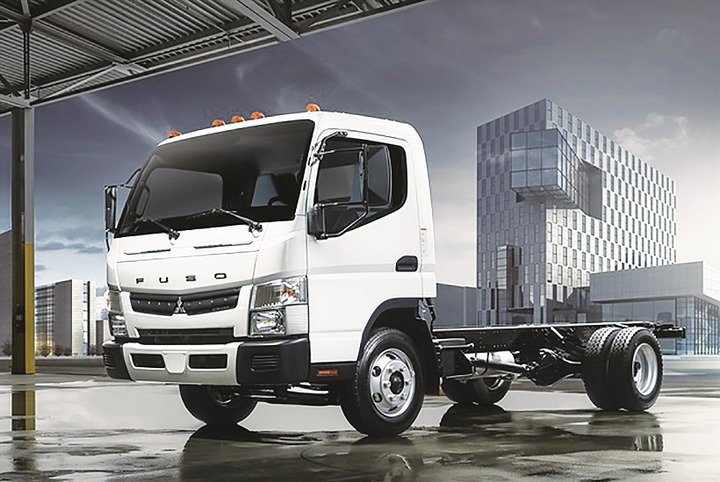 For Mitsubishi Fuso, Daimler AG’s Japan-based medium-duty truck division, its biggest rollout this year is the Fuso FE Gas, the only gasoline-powered truck that the OEM makes. Aimed at the U.S. and Canada markets, it is being built in the U.S. with the company’s Daimler brand partner, Freightliner Custom Chassis Corp. A General Motors-sourced 6.0L V-8 will power Class 4 and Class 5 FE Gas models. In all models, the gasoline engine will turn out 297 hp and 361 lb.-ft. of torque. The gasoline engine will be paired with an Allison 1000 automatic transmission with Fuel Sense 2.0 transmission management software, including DynActive shifting technology that is said to improve fuel economy by as much as 6%. The software uses a Neutral-at-Stop feature to help further reduce fuel consumption. Both the FE Gas and FE Diesel models also boast a new interior, which features a heavy-duty driver’s seat with adjustable lumbar support. In addition, the seatbelts are now red for higher visibility. Also, instrument cluster colors have been improved under various lighting conditions, and there is now an LED cabin light. Storage space has been improved, too, with a new driver side console, floor tray, and sun-visor pocket. And the FE Diesel now has a new transmission, the Fuso Duonic 2.0 6-speed dual-clutch automatic. The upgrade to the 2.0 version includes modification of the dual clutch that significantly improves reliability, comfort and operability, says the company. In addition, it adds Hill Start Assist, and the gear shift shock has been considerably reduced to provide a smoother drive. The Duonic 2.0 maximizes power transmission efficiency by quickly switching between the two clutches, according to the OEM. 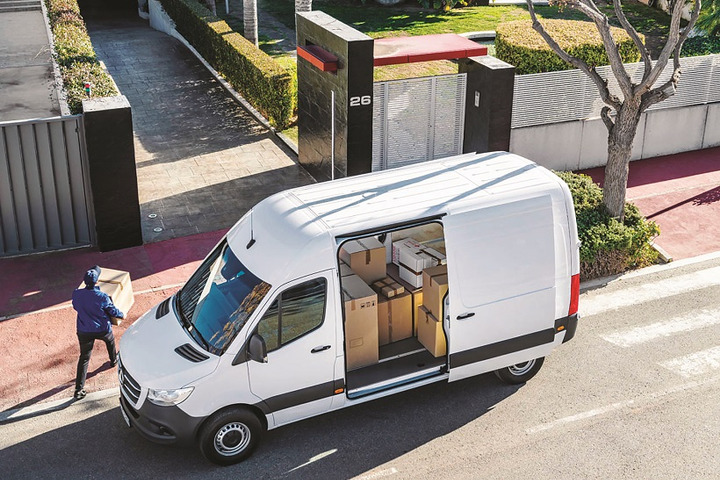 Mercedes-Benz has rolled out the third generation of its Sprinter full-size van. The latest version, being built for the North American market at a Mercedes plant in South Carolina, is distinguished by an optional factory-installed Mercedes Pro telematics system, revamped interior, connected vehicle system, and a 2.0L, 4-cylinder gasoline engine expressly engineered to give U.S. buyers another choice alongside Sprinter’s 3.0L 6-cylinder turbodiesel. Available advanced safety features include Distance Regulator Distronic Plus, which allows following a vehicle in front at a pre-selected distance at a wide range of speeds to relieve driver strain on long journeys and when following vehicles, as well as Blind Spot Assist and Active Lane-Keeping Assist. Also available are Park Assist, Traffic Sign Assist (which draws additional attention to speed limits, no-entry and no-overtaking restrictions), and Crosswind Assist. And among other features, there is also Attention Assist, which gives the driver visual and acoustic warnings if it detects typical signs of drowsiness or inattention — then urges the driver to take a break. This system also records steering wheel movements to create an individual driver profile. Another advanced safety system offered is Active Brake Assist with Cross-Traffic Function. This system continuously checks the safe distance to the vehicle immediately in front, warns the driver optically and acoustically of potential collisions, and autonomously brakes the vehicle to a full stop if required. For 2018, the Nissan NV cargo van is available with either a 375-hp 5.6L Endurance V-8 gasoline engine mated to a heavy-duty 7-speed automatic or a 261-hp 4.0L V-6 with 5-speed automatic transmission. All NV Cargo vans come equipped with standard RearView Monitor, 5-inch color display audio (5.8-inch standard on SL grade), Bluetooth hands-free phone system, streaming audio via Bluetooth, hands-free Text Messaging Assistant, and USB connection port. The previous Power Package option content – power windows with driver’s side one-touch down, power door locks with central locking, auto door lock function, remote keyless entry and cruise control with steering wheel controls – is now standard on S grade vans. Also available are NissanConnect with navigation and mobile apps. The system features a 5.8-inch touch-screen display, Nissan Voice Recognition for audio and navigation, SiriusXM Traffic and SiriusXM Travel Link (subscription required). The NV offers a 120-inch cargo floor length and 70.2-inch maximum cargo floor width. NV Cargo Standard Roof models offer a maximum of 55.8-inch cargo area height, among the tallest in class, says the company. The NV Cargo High Roof provides a maximum 76.9-inch cargo room height – enough for most users to move about the cargo area while standing up straight. The NV Cargo is the only available high roof model in the segment with “rugged body-on-frame construction,” the OEM says. Peterbilt medium-duty truck models continue to feature Paccar PX-7 and PX-9 diesel engines, which offer power options ranging from 200 to 380 hp and up to 1,150 lb-ft of torque. The OEM’s only cabover, the Model 220, offers GVW ratings ranging from 26,000 to 33,000 lbs. Peterbilt says this truck was designed with a low chassis weight to aid high-volume pickup and delivery, as well as beverage and refuse applications. The Model 220 is also available in a right-hand drive configuration for street sweepers and paint striper operations. The OEM’s conventional cab range consists of the Models 325, 330, 337, and 348. 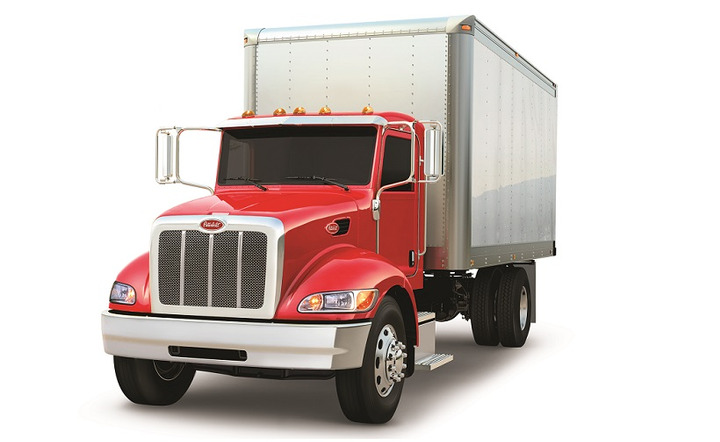 At the top end of Peterbilt’s GVWR offering is the Model 348 truck, which straddles Class 6 and Class 7. 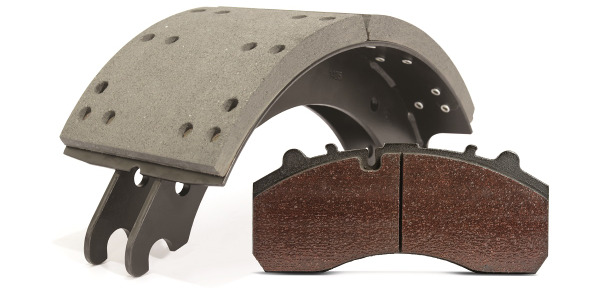 Offered in GVW ratings from 33,000 to 66,000 pounds, it’s designed for such specialty applications as crane, construction, utility, and service trucks. Among new features available across several models is Wabco’s OnGuardActive safety system, on Models 348, 337, and 220. This advanced driver assistance system provides acoustic, visual, and haptic alerts in potentially dangerous situations. The system will also engage the brakes to prevent a collision with a moving or stationary vehicle if the driver does not respond soon enough. The system is always on for vehicle speeds above 15 mph, even when cruise control is disabled. 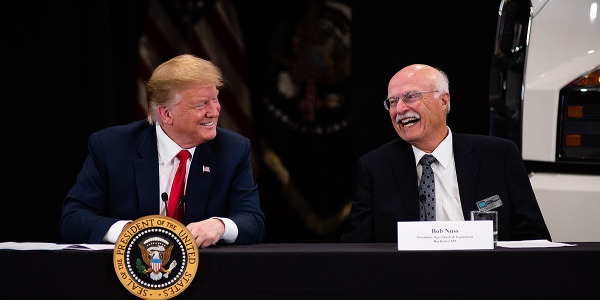 In addition, the OEM says the adaptive cruise control function will help reduce driver fatigue in congested traffic and make cruise control a more useful feature by automatically adjusting vehicle speed relative to the vehicle ahead to maintain a pre-set following distance. 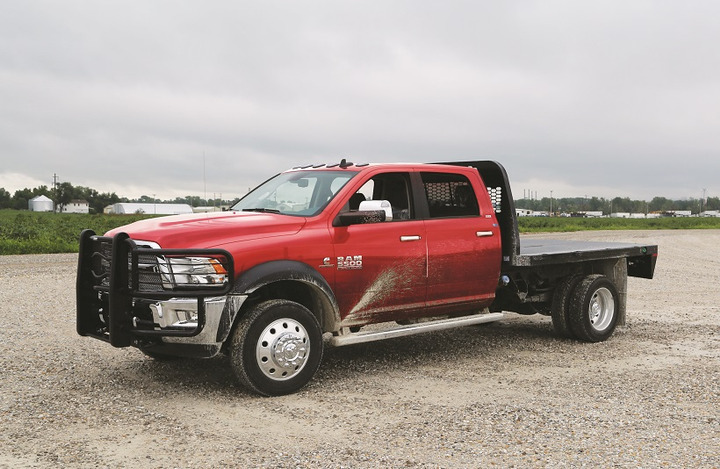 Fiat Chrysler Automobiles’ Ram Commercial line of Ram 3500, 4500 and 5500 chassis-cab trucks, which cover up to Class 5 GVW ratings, now can be powered by two options. The 6.4L Hemi V-8 gasoline engine puts out 370 hp at 4,600 rpm (410 hp at 5,600 rpm under 10,000-lb. GVWR) and 429 lb.-ft. of torque at 4,000 rpm. The Cummins 6.7L diesel is available with a high-output option that produces 325 hp at 2,400 rpm and 750 lb.-ft. of torque at 1,500 rpm. New features for 2018 on these trucks include a backup camera made standard on the Ram 3500 chassis-cab. All Ram chassis-cab trucks can be ordered with an optional ParkSense package, which includes a front park assist system. Also available is hands-free technology with Bluetooth capability on lower-cost radios. A vehicle system interface module eases communication between aftermarket equipment modules and various chassis-cab controls and functions. 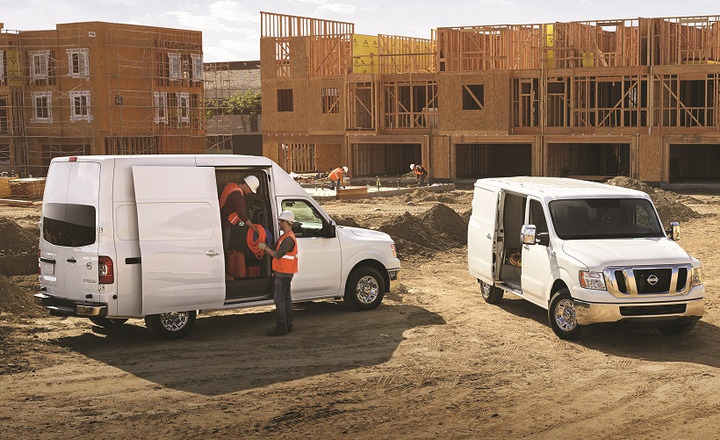 Ram Commercial has also made several updates to the ProMaster full-size van, including increased towing and payload capabilities, an expanded wheelbase, and new high- and low-roof options. The ProMaster now includes a 136-inch wheelbase low roof for 2500 and 3500 cargo vans, and the 3500 is also available with high roof on the 136-inch wheelbase. The van’s payload capabilities have been boosted by as much as 240 pounds. The ProMaster 1500 now has a payload capacity of 4,000 pounds; the 2500 has been upped to 4,230 pounds; and the 3500 to 4,680 pounds. Towing capacity has also been increased up to 30%. • The electric van from Chanje Energy, the V8070, has a gross vehicle weight of 16,535 pounds, capable of a 6,000-pound payload in a 580-cubic-foot cargo space. It’s positioned as a last-mile delivery truck with an advertised range of 100 miles, half loaded on a full battery charge. The van was designed from the ground up as a battery-powered electric vehicle with the basic structure conceived to accommodate the battery pack, the motors, etc. The company plans to build a North American manufacturing facility in the near future, but the vans are presently fabricated in China and based on a Chinese design. • Workhorse has designed a last-mile delivery van powered by electricity. 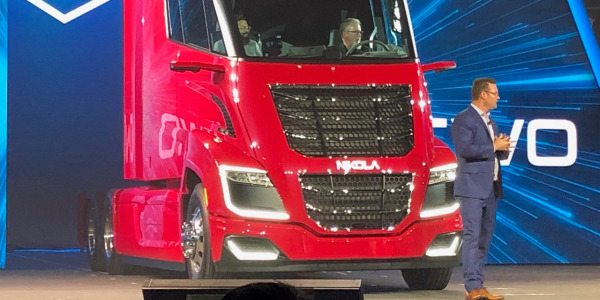 The N-Gen features an ultra-low floor to maximize cargo volume and reduce driver knee and back stress, advanced telematics and collision avoidance systems, and 100 miles of all-electric range. Optional are a range extender and unmanned package delivery drone. This is in addition to Workhorse’s existing all-electric E-100 model, which is built with a more traditional step-van body. 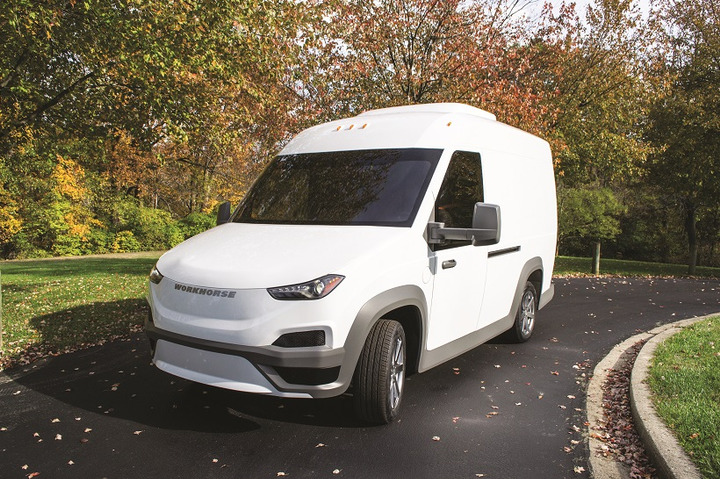 • Spartan Motors is teaming up with Motiv Power Systems to supply battery-electric chassis products for Class 4-6 Utilimaster step vans that can offer a range of 100 to 150 miles per charge and up to 30% gradeability, according to Spartan Motors. • Agility Fuel Solutions announced this year it will offer a compressed-natural gas-powered step van with a Morgan Olson body and a chassis built by Freightliner Custom Chassis Corp.
• If you’re looking for more alt-fuel options, companies such as Efficient Drivetrains, Lightning, Roush CleanTech, and XL offer conversions for electric, hybrid, propane and natural gas fuel systems.